Technology Knowledge Workshops are being offered again this year, so stay tuned. We plan to have some workshops during Period 4. We know that some of that time is already reserved for the PLC sessions, so we will do our best to offer as many as possible with everyone's busy schedules. Some of our previous TKW sessions included e-Books with Follett Destiny, Gale Virtual Reference Library and the use of the Cricut for classroom bulletin boards. We will schedule a variety of technology tools and ideas for classroom projects as required by FCS, including Animoto, Prezi, Smore, Voki, blogs, videos, wikis, apps and more apps, and so much more! We believe you will enjoy learning as much as we do! Please have a great school year with more technology as we work together to assist our students to become college and career ready! Technology is awesome! Please stay tuned as we go forward with assisting you and your students with the phenomenal uses of technology! If you have any additional questions, please do not hesitate to send us an e-mail or visit us at the RHS Media Center. 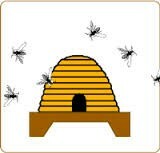 The RHS Hornets are Busy, Busy, Busy, Busy! 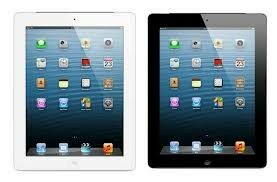 iPads and More Technology! Yahoo! 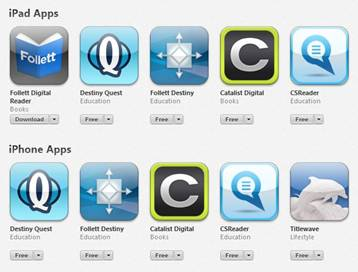 Follett Digital Reader App and More Apps! Wahoo!